Really? A Christmas horror category!? Sure, but they aren't really horror shows, more like suspenseful radio shows with a Christmas twist. 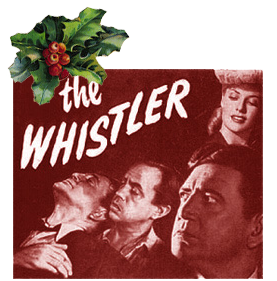 Can you imagine The Whistler beginning a show by whistling a Christmas carol? 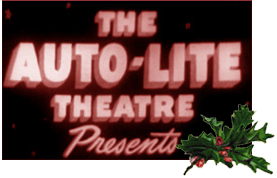 Christmas in Suspense was an old-time radio show that excelled at telling a good story. For example, in 1959, Suspense aired "A Korean Christmas Carol. "The story is told from the point of view of an American soldier stationed in Korea. The soldier, feeling down and driving back to camp alone, picks up a soldier on the side of the road. From there, very strange things happen. You might recognize elements of the story from ghost stories told around a camp fire when you were a kid but with a twist. This popular old-time radio show, on the air for 13 year, starts with a man whistling...he is The Whistler. At the start of the show, The Whistler talks about walking the night, knowing "strange tales and nameless terrors hidden in the hearts of men and women who live in the shadows." Very Christmas-y don't you think? Even though the Christmas shows begin ominously, they are Christmas shows. In the Christmas episode, "Letter from Cynthia," a medical intern receives a letter from a lost love, the love he lost to his best friend. In a strange turn of events, the man who took his love, his best friend, ends up in an accident at the hospital where he is interning. He has to make a decision between getting revenge and doing what's right. You won't want to miss Christmas in Suspense! Old Time Radio Collection for more holiday thrills!